By following a few simple tips & remembering our mantra, “Everything In Moderation,” you can eat, drink, and be merry during the holidays without the unwanted effects that can last into the New Year. 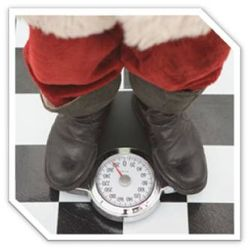 For tips to avoid those extra holiday pounds, check out Dana James’ entertaining and educational run-down of how to get fat this festive season. The holidays are also a time for travel. Whether you are visiting family or going to a resort, you can maintain your pre-holiday fitness level by following some advice offered by Yahoo in its article keeping healthy while on vacation. We all like to be able to offer family, friends & guests delicious holiday treats – and even better if your secret is that the recipe is actually pretty healthy! Try Robin’s Almost fat-free Brownies and check out this Apple Crisp Recipe for delicious sweets without the guilt.